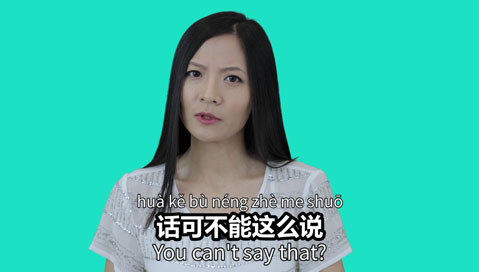 What if someone says something that's not quite right or something you disagree with, how would you respond in Chinese like a native? Learn how to say you can't say that in Chinese, and learn how to say that's not quite right in Chinese. in this short video lesson. There are two short dialogues and also one example sentence where you can learn how to say you can't say that in Chinese. Feel free to click the slow audio for the words used in the dialogues. Find more free lessons here. huà bù néng zhè me shuō! You can't say that! That's not quite right! Someone says something to you that's not quite right or something you disagree with. When someone says something that's too one-sided. 你怎么能这么说？nǐ zěnme néng zhème shuō? How could you say that. 事实上并不尽然。shìshí shàng bìng bújìnrán. In fact, it's not quite that way. The more expensive clothes are the better! They still have to suit you.